With a rigid heddle loom many designs are possible in plain weave....stripes, plaids, juxtaposing different textures and weights of yarn, even playing with sett differences and simple hand-controlled lace weaves are possible. We stock the 24" width Ashford model, although we can certainly order other sizes. This seems to be the most popular width (you can do pieces of fabric to cut and sew, shawls, tea towels, and it is still easy to put in the closet for storage when you have guests over!) and it is the best value. It is easy to use and quick to set up. It can be warped without a warping board and comes with some accessories to get you going (sley hook, stick shuttle).An optional stand can be purchased if after weaving a bit on your table top you decide you'd like that. And additional reed sizes can be purchased for using heavier or finer yarns in the warp. 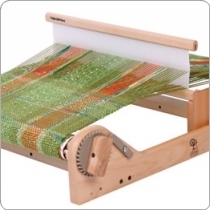 We also have peg looms and lap looms and tapestry looms at the store. This has been a popular model. It is easy to warp (all tools included) and comes with a stick shuttle, sley hook, instruction book and a 10.5 dpi reed. A stand for this model is also available at the store, but must be purchased separately.